This couldn't be more beautiful! I LOVE it! Aw, that's pretty! Love the frame! This is lovely and after yesterdays putting stuff in a circle experience I'm drawn to this! Fantastic purse, especially the pearls!! And great tutorial. Aha, now the previous post makes sense, Liberty and linen, what a great combination! And so sophisticated – I badly need something just like this for a cocktail party I have to attend in August. 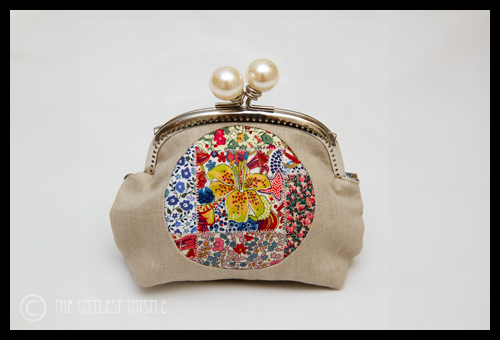 What a pretty purse, I love the pearl clasp. How cute is that purse?? Tell me though – have you glued into a stitch frame? ?